High water pulls in fish! 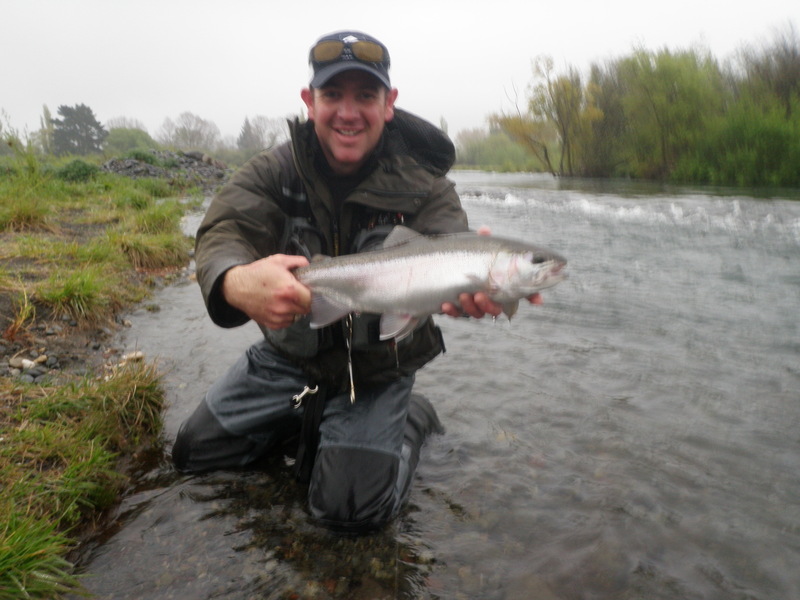 Hi again, Taupo has once again been hit with nasty, wet, windy and cold conditions which has kept alot of anglers away from the rivers over the past couple of day. 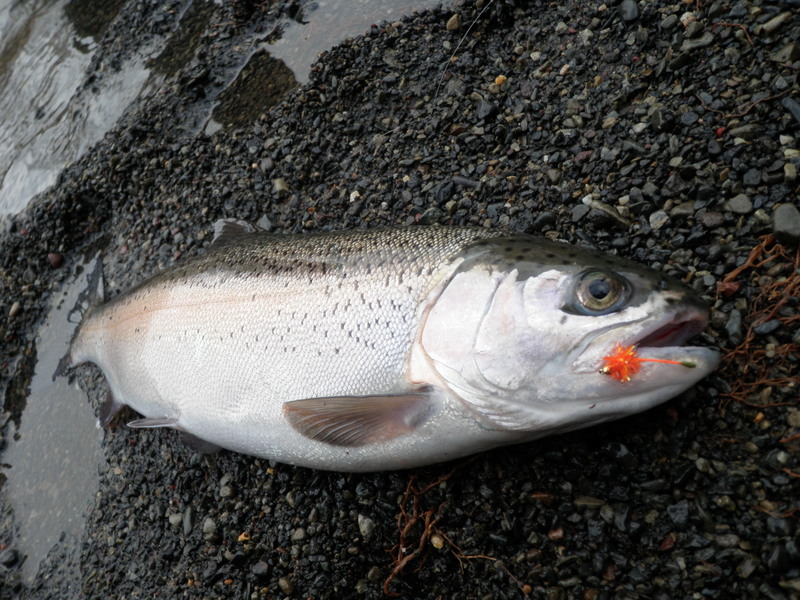 I fished on Friday in soaking wet conditions and did pretty well in most of the river with fresh fish. Friday night we saw some real heavy rain which as a consequence pushed the Tongariro flow to over 80 cumecs which is just about un fishable. I would fish these conditions if I had no other choice and would concentrate on targeting the edges and river by passes with big glo bugs or wetline with a black fur fly. After the lack of fish that pushed into the river following the last flood I was sceptical if this flood would be any different as it is getting late into the normal spawning season now. Last season my best months with trout numbers and guiding were October and November which after today I feel they may be the same this year. The Tongariro wasÂ at a perfect level for fishing today with little wind no rain and a nice green colour to the water which was jam packed with trout and no anglers. Many anglers have once again bit put of by the weather man but at the end of the day he knows nothing about spawning fish and you should have been here. Every pool below the bridge was full of silver bullets and fished very well with glo bugs first thing and then caddis once the day got on. Fish were in big numbers in pools such as Reed, Smallmans Reach, Bends, Delatours and all through the braids. It was 11am when the first angler was sighted in the lower river around the Bends today which gave some awesome fishing alone for hours on end. All the fast water in the braided area had good numbers of fish on the move which were picking up glo bugs on their way through, I would imagine these fish to be mid river tomorrow. Hen fish were very , very fat with eggs and nearly dropping so it is obvious to me that these fish are just leaving runs later in the season until conditions suit. Late runs are welcome in my books as most anglers have written the season ofÂ and are nowhere to be seen but also having these fish in the system at this time of year will set the summer fishing up nicely and give some good dry fly sport early. The amount of fish we have had through over the weekend should provide great sport for this week if they can be followed up the river and with time on my hands I will be shooting up there again at first light to try and locate them again. Occasionally some of the bigger rainbows can be caught at this time of year as they have not decided if they wanted to spawn or not and have stayed in the lake longer eating well putting on weight before making the move into the rivers. 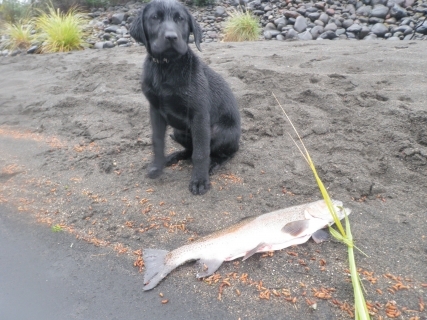 I should assume all rivers in Taupo will have had new fish in them and the other obvious river to target would be the TT s this has also fished very well in the past month when the river is coloured and high. Over the weekend Taupo held the annual Kinloch fishing comp which attracted over 300 anglers which tried their luck on the lake at getting that big one. This is the biggest event fish wise held in Taupo every year and attracts huge sponsors and support from many local businesses. The weather was not the best for it this year and on the first day many boats were confined to quiet bays around the boat ramps to stay out of the wind but Saturday was a different story and many got out to their favourite hunting grounds. The best conditioned fish had a condition factor of 60 which is a very good looking strong fish which should have been cloned for the future. The average condition factor of all fish weighed in was not too bad with it coming in at 41.86 which is a fish that you would keep for the smoker in most cases. The winning fish was again a brown trout which weighed 2.8 kilo so not as big as I thought it would be but in my opinion if they want big fish they need to open the comp to rivers aswell and not confine it to the lake only, we know where the big browns live. I went out and watched the weigh in forÂ a couple of hours and was surprised to see a couple of fish which were undersized weighed in!! This is cutting your own throat surely, how hard is it to measure 40cm, why would you keep a fish that small anyway? What is disturbing is that nothing gets done to law breakers, why have legal limits and measures if they have not gotÂ consequences behind them! Anyway hope you all get down in the next couple of days and get into the rivers there are some great fish to be had.